Just What is a Dab? For many of us who have been smoking cannabis for some time, dabbing might not seem like such a foreign concept. But for those who are new to smoking weed, dabbing can be this strange alien form of ingesting the substance. A dab usually refers to a small glob of cannabis concentrate, the glob is then held on either a thin piece of glass or metal. At this point it’s time to break out your butane torch, these torches burn at over 2000 degrees Fahrenheit so take care! This is the part where some people get a little weirded out, using a torch to heat up a glass, crystal or titanium nail can conjure up thoughts of other unsavory drugs. It might seem a little extreme at first, but once you take your first dab it will have all been worth it. So after heating up your nail, it’s almost time to inhale. 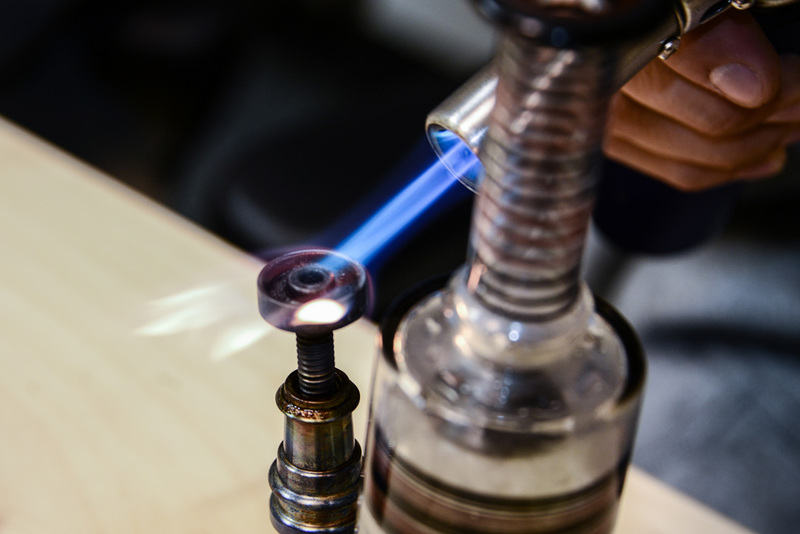 Simply press the glob of your chosen concentrate to the nail and either inhale or proceed to cover the nail with a glass dome (depending on whether you are using a domeless dab rig or not) and then inhale. It might seem a little convoluted at first, but once you get the hang of it dabbing is a relatively simple process. One nice benefit of dabbing is that, depending on your tolerance level, one dab could be all you need. For those who don’t dab often you might find yourself getting incredibly high off a single inhale, mainly due to the fact that you’re typically inhaling an exorbitant amount of THC. For people who dab often the other hand, being able to inhale that much THC at once make their tolerance skyrocket. One common complaint from many a dabber is that after dabbing on a regular basis, dried herb won’t even do it for them. Sure they can light up a joint, but they won’t get quite as high as they would have liked. Essentially, dabbing can lead to a slippery slope wherein you’re looking for the concentrates with the highest percentages of THC and end up taking larger and larger dabs. Speaking of concentrates, some of the oldest and widely recognized ones are classics such as kief and hash. You can make these old-school concentrates by hand and the process of doing so is often simple, yet at times tedious. While these concentrates have been around for centuries, only more recently have people begun to create new types of concentrates such as BHO (butane hash oil), C02 oil and RSO (Rick Simpson Oil). Each of these types of cannabis oil has its own process required to extract the main psychoactive compounds from the plant. Concentrates such as hash tend to have 20%-60% THC, whereas concentrates such as BHO will typically test between 60%-90% THC. BHO is one of the most widely sought after concentrates, usually in the form of shatter. While BHO is often one of the strongest concentrates available, it also has the highest potential for error. During the butane extraction process, it’s possible for traces of butane to be left in the concentrate. That’s why it’s always important to make sure your BHO has been tested for purity, as improperly extracted BHO can have traces of butane in it. I would highly recommend dabbing as I’m sure almost anyone would who has tried it. Dabbing is great for just getting incredibly stoned and hanging out with friends. However taking a dab before you have to get work done might not be the wisest decision!